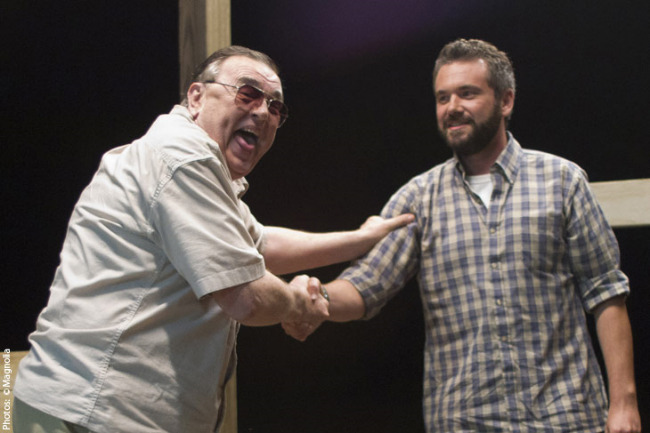 The Sacrament unfolds fairly predictably, but makes a star out of Gene Jones and the cameras themselves in the process. 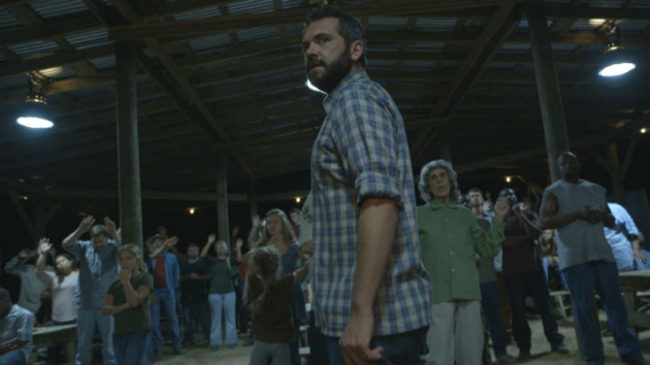 I kicked off this year's 31 Days of Horror with The Sacrament, the sixth feature film from writer/director Ti West. It's fitting because I began this tradition month-long movie marathon tradition two years ago by watching The House of the Devil, an '80s throwback by West that deeply impressed me. That film might be the slowest burn I've ever seen; it's practically 90% build-up before the film finally lives up to its name. West has made a career out of the delivering tension by degrees until the situation has become a boiling room of suspense. And so I was surprised when The Sacrament became alarming relatively early in its running time. This faux documentary (an important distinction from both found footage and mockumentary) follows a couple of reporters for Vice played by AJ Bowen and Joe Swanburg. Being an occasionally audience of Vice's content, I can report that the tone and feel of their investigation into Eden Parish, a radical and isolated spiritual commune, is spot on. Their gateway to this community (*cough* cult *cough*) comes from a co-worker's sister, a once drug addict who was saved by the guidance of a leader they call Father. Within no time we're joining the journalists on their journey to this utopia, as skeptical as they are. They've created their own little paradise, free of the prejudice and pressures that we deal with in everyday life. Many of the people they interview seem grounded and grateful for what Father and the parish have done to their lives, but there's plenty of suspicious signs along the way. Including the behavior of their friend's sister when they press to much. That and the rifle toting "guards" watching the perimeter. The Sacrament unfolds fairly predictably. It is a horror film after all and something terrible was always in the card. It loses some of its effect in the events that follow, but gains them back in some crucial scenes/shots. One thing I especially admire about West as a horror filmmaker is his ability to make occurrences set outside and in broad daylight be scary, something especially evident in "Second Honeymoon," his brilliantly unsettling contribution to V/H/S. Furthermore, it's fascinating to see how the camera is used and how it gets a new videographer when the chaos reigns. Many of the found footage films we see these days lack any convincible reason to keep rolling. I guess the film owes a lot to the prying practices of Vice.